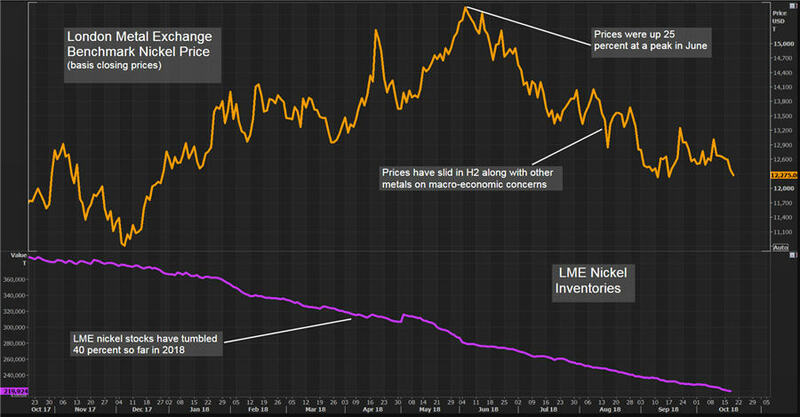 LONDON, Oct 19 (Reuters) – The bulk of nickel moving out of London Metal Exchange-approved warehouses in Asia is showing up in hidden facilities in Europe, analysts said, denting a bullish scenario of potential shortages. 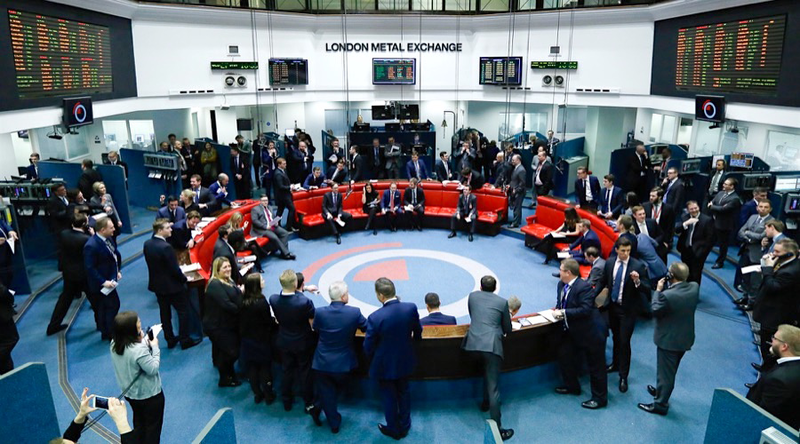 It has been the LME's top performer this year and prices were up 25 percent in June, before the wider market was hit by macroeconomic worries. 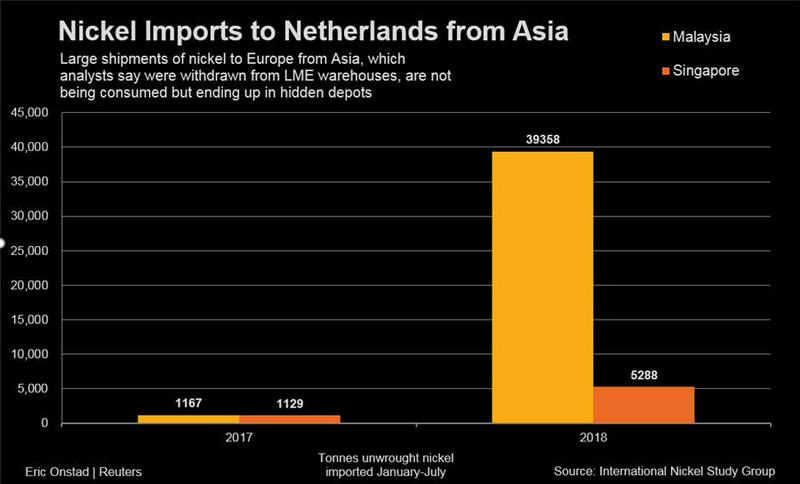 Some investors have been bullish about the sharply lower inventories, arguing that deficits and strong consumption were finally cutting stockpiles and raising prospects for shortages.Trade data shows that much of the nickel departing Asia is arriving in the Netherlands, a warehousing centre with both LME depots and non-registered ones with cheaper rental rates. "Some people are taking a bullish tone from the draw in stocks, but you shouldn't be 100 percent bullish about the stocks draw if you look at where the stock is travelling," said Macquarie analyst Vivienne Lloyd. "Europe is not such a big nickel consumer that it would suddenly need such a large stock draw from the LME Asian warehouses. So, it seems more likely to point to stocking behaviour in Europe." "It’s not just Malaysia. You’ve seen significant volumes of material move from Singapore and Taiwan to Europe," said BMO Capital Markets analyst Colin Hamilton. "I think this is material being locked into financing deals." 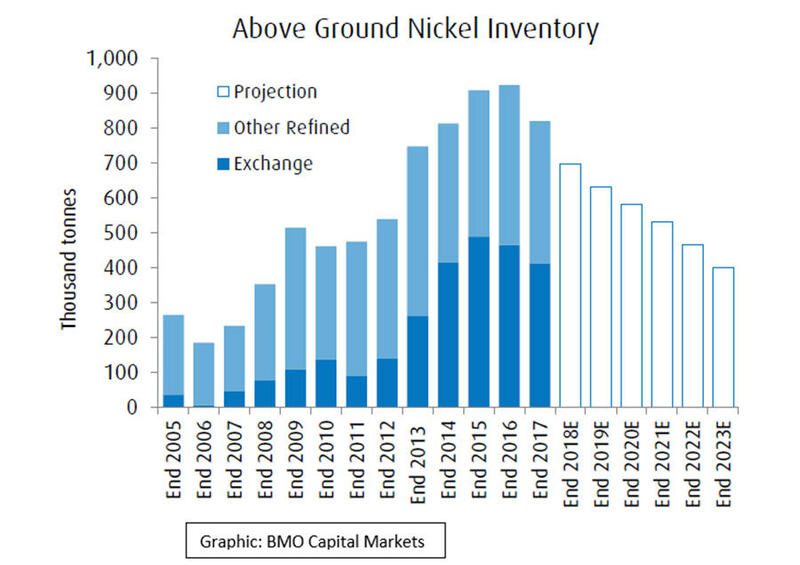 BMO Capital's Hamilton estimates that 465,000 tonnes of nickel are stored in hidden, or non-exchange, warehouses. That is nearly double the 235,019 tonnes in warehouses linked to futures exchanges for which data is available. Hamilton expects nickel to end the year close to current prices, while Macquarie's Lloyd sees it rising to an average of about $14,000 a tonne in the fourth quarter.